Consider the walkways leading up to your home. If they are well lit, then you never need to worry about elderly family members or guest, or otherwise-compromised visitors to your home, tripping on your property just because they couldn’t see where they were going. Outdoor lighting that’s zoned in appropriate places is a great way to brighten up areas of your yard and landscaping where you’ll be entertaining or spending the majority of your time when you have guests over. You might consider lighting in spots like your patio, deck, garden, pool area, or outdoor seating areas. We think we can safely assume that you’d like to guard your home as best you can from burglars or vandalism. First off, we do recommend having an alarm system installed. But there are other steps you can take to fend off intruders, and it’s as simple as the right outdoor lighting. A well-lit home is much less likely to be victimized and robbed than one that is dark and inconspicuous at night. First off, if you have lights on, a burglar will assume someone is home and that they’re more likely to be caught if not by the homeowner, than by a neighbor or passerby. Secondly, no thief wants to draw attention to themselves by attempting to break into a home with lights on everywhere. The right kind of outdoor lighting can create an illusion of a larger space. This is mostly true indoors, but it can also apply to outdoor settings. For instance, if you have a deck or patio with seating on a balcony, outdoor lighting can be utilized to visually extend the area and brighten up the space to draw more attention to it. 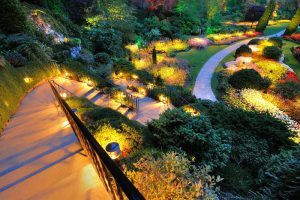 Have you ever thought about getting uplights installed around your landscaping? Implementing this in the right areas can pull the eyes to those areas you want highlighted. You could even consider things like “mood” lighting along the exterior of your home, and low voltage lighting to highlight planters. Whatever you have in mind with your outdoor lighting, we’re sure we can help your vision come alive! At Dalton Plumbing, Heating, Cooling, Electric and Fireplaces, Inc., your comfort is our promise. To set up an appointment, give us a call at the number above, email customerservice@daltonphc.com or schedule an appointment online.